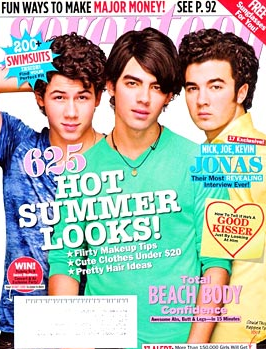 The Jonas Brothers made the cover of the June/July issue of Seventeen Magazine. In the issue, Joe talks about where he pictures himself in 5 years. "I guess personally, I would love to do more acting, maybe movies," Joe says, "That would be really cool. I think Johnny Depp's work is really great - he always incorporates music into what he does. And maybe write a book one day, because I love to read. 'The Alchemist' is my favorite book of all time." Nick, Joe and Kevin shared their pet peeves, "People who are always telling you that you must be tired, you must be exhausted. It's like 'no, no, I'm okay.' That's one of our pet peeves. We do work hard, but don't put words in my mouth, you know? I hate that."